Automobile Safety & Garage Safety! Maybe this month’s full moon has made a dent in garages and cars…literally, or maybe it is a mere coincidence, but we have heard about and seen more autos colliding with garages then we could realistically imagine. Let’s begin by saying the what spawned this post was “a car hits a garage encounter” by a customer at a friends shop. It was 30 minutes before Tim opened shop. An early customer decided to park right in front of the garage so that once the shop opened, pulling straight in was all that needed to be done. Well shop is about to open, but the customers car needs to go into a different area. She was asked to go ahead and move her car, which she proceeded to do, but rather than reverse to move where hs needed, she (accidentally) out the car into drive and hit the gas. BASH! Right into the shops garage. Needless to say, it was an accident, but not fun for my buddy’s shop or the woman’s car. This post is meant to drive awareness…. Be aware of the garage! Not only will your car get a bit beat up, but garage fixes are not cheap. Your homeowners or auto insurance may the claim, but without proper insurance or if you’re a renter……be aware of that big piece of metal or wood! We decided to reach out to the garage door company, Ahwatukee Garage Doors, that fixed my buddy’s shop garage. We wanted to get insights of how many garages they fix from vehicles hitting and damaging the good ol’ door. There response was, “more than you would think.” They also informed us that in the past month alone they repaired six, yes SIX garages that had been damaged by automobiles…crazy huh?! Two of those happened from teenage drivers, and the other four from adults. Maybe it is the full moon. Maybe people are getting antsy as the seasons change, who knows! Well here is a little advice on how not to damage your garage with your car. It may seem crazy, but it happens. Whether it’s a tight fit getting your car into the garage or it’s lack of distance perception, take a minute to review what could save you a big headache, time and money. Attach a Tennis Ball. If you are unsure of the stopping point once you’ve entered your garage, hanging a tennis ball can be a great cue and forewarning of when to stop. Hang the ball so that as you pull the car in you know to stop when the ball is touching the windshield. Install Bumpers or Blocks. This is helpful especially if it is a tight squeeze. You can use pool noodles or block where you need the most. This will prevent you from hitting the sides of the garage and you car. Turn Your Headlights On. This tip is obviously helpful at night, especially at dusk when they may still be off, but the light is dim or you don’t have a light in your garage. It is always quite helpful during the day and will create more see space as you pulling in. Side Reflectors. If you park outside of the garage and are concerned about hitting the garage from pulling up to close, a great thing to do is attach a reflector to an upright pole and use it as a cue when to stop. Place it a few feet from the garage door on the side of your driveway (maybe even use 2). As you pull up, stop inline with the reflelctors. Especially helpful at night. Be CAREFUL. Slow down and take precautions. You will wish you had should you ding your garage door or your car. If you have a tight squeeze, really just pay attention. No cell phones or diverted attention, just total awareness with what you are doing. Let’s face it, we drive our cars on a regular basis, but many of us don’t know much other than what type of car we drive, how to put the key in the ignition and how to fill up the gas tank. With the amount of money that is spent to own and maintain a vehicle from auto payments to tune ups and maintenance, you would think more people would know a little more. However, all of the information can be overwhelming and honestly, not that interesting to most. Maybe some other figure in your life takes car of the car and what it needs, or maybe that figure is the local auto repair shop. Regardless, you really have no clue about much other than you own your car. Well today is the day to learn a few basic tips that you should know. It’s not mechanic school and you will not be quizzed at the end, but these few things will prove to be valuable and assist you when in need, but also give you a basic understanding and help you feel more confident as an owner and operator of your vehicle. You never know when some of these basic tips will really come in handy. So take 10 and read on! engine lights and indicators – these lights are a headache to see…..oh no what’s wrong with my car? That can mean you put off seeing what’s wrong until the car breaks down. Well these dashboard lights are symptoms of your car’s overall health. It is important that you see what’s going on. Turn to your owner’s manual for reference and take necessary action. You may have no need to worry, or you may need take your car in ASAP. Simply being aware of warning lights can and will save you from additional damage, and extra money spent. Tire Pressure – probably the most ignored maintenance issue with a car. The reason it is often ignored is because tire pressure is not regularly checked. Underinflated tires will not only wear your tires faster, but waste gas…..the end result is money wasted. The next time you fill up the tank, check your tire pressure and add some air. It really is simple, just not at the top of the priority list. 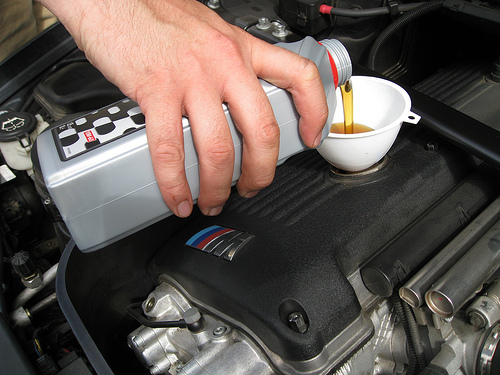 Oil – the cars lubricant that keeps things running smoothly. Not only should you regularly have your oil changed, but you should make sure you check it periodically, especially if it seems oil may be leaking from your car. Dirty oil can even make your car run rough. VIN # – where to find it and why you need to know it. The VIN number is your car’s identity. It is on your car registration, but it is can also be found on your vehicle. Check the inside of door of the on the driver’s side and you should find your VIN#. This is useful for repairs and insurance. Brakes – your brakes should overall run smoothly. At times they may sound a little squeaky which can mean dust in the brakes or the need for new pads. Grinding, shuddering, scraping or any other weird sound or vibration should be immediately checked. These tips are to keep you safe, as well as save you money. Keeping your car healthy will keep you safe and financially healthy. Automobiles are not cheap. Keep them running smoothly by being mindful of a few basic things. If you ever need assistance, your local Autozone or other auto parts store may be able to help you. If you purchase from them, example: windshield wipers, they will help you install them properly. Just make sure you tend to the health of your car.